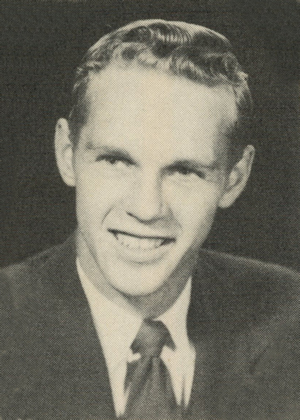 Obituary – Jones Jr., Harry Payne « Perry High School Alumni Association, Inc.
Basketball 48-49, Annual Prince 45-46. Services are planned for 2:30 p.m. Saturday at Strode funeral home chapel for Pfc. Harry P. Jones, 22, who died Tuesday at Camp Carson, Colo. The Rev. Poe Williams will officiate. Interment will be at Fairlawn cemetery. The body may be viewed until noon Saturday. The young soldier was a member of Company C, 32nd Combat Engineer battalion. The son of Mr. and Mrs. Harry P. Jones, Sr., he joined the army immediately following graduation from Perry high school. A member of the First Methodist church, survivors besides his parents are one brother, Jay B. Jones of 712 N. Duncan, and Mrs. Walter H. Hurt, 232 S. Lewis, both of Stillwater.